The Pac-12 winds up the regular season this week with a few loose ends. Seventh-ranked Washington State hosts No. 16 Washington on Friday in the Apple Cup with the division’s spot in the Pac-12 championship game on the line. For Washington State, the stakes are higher. The Cougars still have a shot — however slim — of making the College Football Playoff. But they’ll need to beat the Huskies, then beat Utah in the conference championship, and hope a couple of teams above them in the national rankings tumble. If the Cougars win out and don’t get selected, they’re headed for the Rose Bowl. But first things first. It will be the 111th Apple Cup, and the third in a row where both teams are ranked. Two seasons ago, the Cougars and the Huskies were both 7-1 in conference play going into the game in Pullman and Washington won 45-17 to earn a spot in the league championship. The Huskies went on to face Alabama in the CFP semifinals. Washington has won the last five Apple Cups, but coach Chris Petersen isn’t counting on recent trends for this one. This season has been too strange for that. “I think you just look at what’s happened around our league and every program in there. I think that says it all. 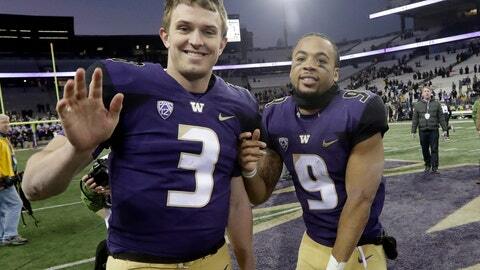 It’s very, very different year to year in college football,” Petersen said. BOWL BOUND: Bowl season is quickly approaching, so here’s a handy primer for the Pac-12’s arrangements: The league has seven bowl partners, led by the Rose Bowl. The winner of the Pac-12 championship goes to Pasadena — unless it is one of the four national playoff teams, and then it would go to either the Orange or Cotton bowls. The Rose Bowl would replace the CFP-bound team with another league team to face an opponent from the Big Ten. After the Granddaddy Of Them All, set for Jan. 1, the other bowls are: The Alamo Bowl against the Big 12 on Dec. 28, the Holiday Bowl against the Big Ten on Dec. 31, the Redbox Bowl against the Big Ten on Dec. 31, the Sun Bowl against the ACC on Dec. 31, the Las Vegas Bowl against the MWC on Dec. 15 and the Cheez-It Bowl against the Big 12 on Dec. 26. Let’s take a moment to appreciate the bowl named after a popular snack cracker. Currently, there are six teams in the league that are already bowl-eligible with one game left. RIVALRY WEEK: In addition to the Apple Cup, there are two other conference rivalry games this weekend. Oregon and Oregon State meet Friday in the annual Civil War, which is essentially only for pride this season, and Arizona faces Arizona State on Saturday in the Territorial Cup. The game is important for Arizona because the Wildcats need one more win to reach six and secure bowl eligibility. USC hosts Notre Dame in the 90th meeting of their intersectional rivalry, and Utah hosts BYU in the Holy War. Colorado visits Cal and Stanford is at UCLA for the other two regular-season finales. Utah coach Kyle Whittingham isn’t particularly fond of having the Holy War at the end of the season — and on Saturday — because the Pac-12 championship is looming in the distance and the North’s representative will be determined Friday. Speaking of Utah, they’ll play for the Pac-12 championship for the first time since joining the league. HOTSEAT UPDATE: Mike MacIntyre became the first Pac-12 coach of the season to fall when Colorado dismissed him Sunday. Clay Helton still has his job at USC as of Tuesday. This seems to be shaping up to be a quieter offseason than last year when there were five coaching changes.